The Skylanders model of toy + video game was a huge success. 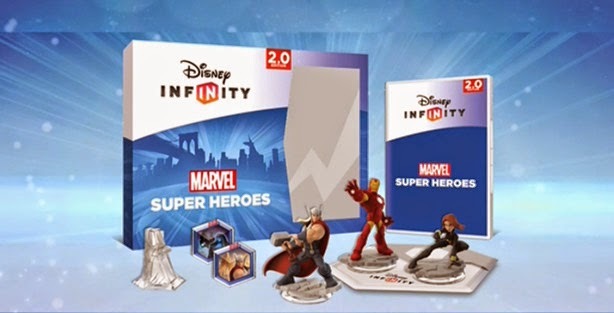 So much so that Disney followed it up with their Infinity game. Sure there are differences in what you can do with the games but the most basic concept is the same; put a toy on a reader and it does something in your game. I grabbed the first Skylanders when it came out because I thought the concept was so interesting. That and I could make a walking shark wear a pirate hat and punch things with brass knuckles. Despite really liking the blocky art style of Disney’s Infinity game I was okay with admiring them on the shelves and not jumping into that game. Disney is ready to start talking Infinity 2.0 and that involves Marvel. To start with we’ll be getting the Avengers cast. There will be 20 playable figures released, so we can start speculating on who those will be. Spiderman and the Guardians of the Galaxy both show up in the teaser video. The characters keep the Infinity style and it works for most of them; I didn’t care for the Modok in the video. I don’t know that I’ll be picking up the game but I’ll be watching the release closely. Hopefully they’ll make an Iron Fist figure. The other thing to remember is that Disney owns another big franchise that would do very well in an Infinity style game. Seriously if they start making Star Wars Infinity I’ll probably have to sell my house.